Some of you wanted to see a tutorial on my turquoise smokey eye look that I posted a few days ago. This technique is rather simple and the turquoise can of course be replaced with other colours. I had fun recreating this look and I hope you like it! 1. Start by defining the outer V, using a black kohl eyeliner. 2. Blend the liner with a matte black eyeshadow. 4. 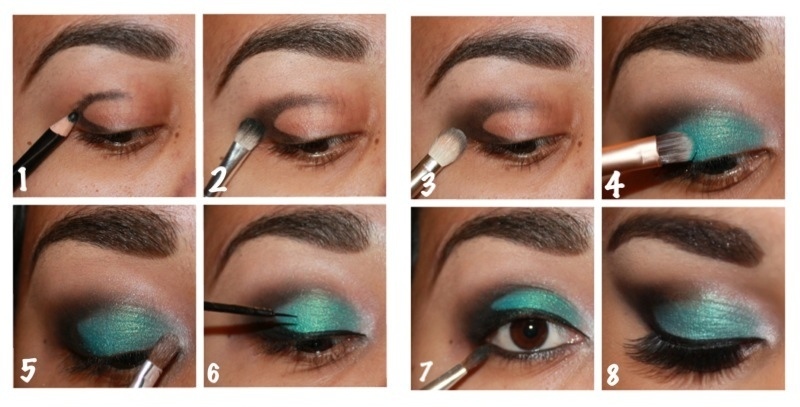 Apply a turquoise eyeshadow on the eyelid only. 5. Apply a shimmery eyeshadow to the inner part of your eye. 6. Apply liquid/gel liner to your upper lash line. 7. Add some liner to your waterline and apply black eyeshadow to your bottom lash line. 8. Apply false lashes or mascara. Let me know if you try this look! I loved this look and helpful tutorial so much – it’s bookmarked! Fab job! Love love love this look! Really pretty look and nice tutorial! Thanks for the tutorial, i love these kind of posts!!!! Thank you so much!!! I cannot wait to do this! Again, thank you! OMG!! I will be trying this as soon as I get home! Thank you so much! You are super talented. Thank you! 🙂 please post a pic on your blog if you try it! It will look gorgeous on you!! Great Step by step eye shadow tutorial. I’ve been looking for a way to do a smoky eye and your way seems so easy. Thanks for the post!! AMAZING Blog!! Thanks hun! Let me know how you like this technique if you try it! I will let you know. I not one to wear too much makeup, especially because I think I’m doing it wrong. smh, lol. My routine consists of eye lashes, liner and gloss, simple. If I’m feeling frisky I go for the eyeshadow and blend it so much that it’s not too visible, ha ha. I know I’m a mess. I will get it together. 🙂 Happy Holidays! I’m clubbing this weekend. I may have to try this out. Wow! This is gorgeous. I love the photos you take of your makeup looks. Thanks for visiting my blog, btw.